Loop trails wind through the old river floodplain, where huge oaks, walnuts, elderberries, and wild grapes form a lush environment for acorn woodpeckers, sapsuckers, towhees, and other songbirds. Background: Cliff bluffs, forests, meadows, ponds, and a creek border this urban wildlife haven along the American River. Loop trails wind through the old river floodplain, where huge oaks, walnuts, elderberries, and wild grapes form a lush environment for acorn woodpeckers, sapsuckers, towhees, and other songbirds. Heavy understory offers cover for raccoons, skunks, and small mammals. Dutchman's pipevine attracts coloful pipevine swallowtail butterflies. Three small ponds provide water for California quail, wild turkeys, and black-tailed deer, tracks next to ponds and riverbanks may belong to bobcats, coyotes, river otters, or beavers. Herons wade along the shallow river edges and salmon spawn on the exposed river cobbles. Common mergansers, common goldeneyes, and wood ducks visit seasonally. Several birds of prey are residents. Explore tule huts, an acorn granary, and a large grinding rock while learning about native ways of life in a replica Nisenan Maidu village. The Habitat: The Effie Yeaw Nature Center is part of a Riparian corridor along the American River. Most of the park is oak woodland (75%) but there are also three ponds and a large meadow, as well as 1/4 mile river interface. The Experience: While Riparian corridors continue to disappear throughout California, the Effie Nature Center offers the public an opportunity to experience a diverse ecosystem abundant in a riparian habitat's flora and fauna. 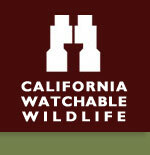 Wildlife and Where to Find It: The best way to view wildlife is by walking the trails. Wildlife can also be viewed from canoes and rafts in the river. Viewing Tips: Watch for wood ducks, songbirds, and birds of prey in spring. Waterfowl, herons, turkeys, deer, and small mammals are seen year-round. Look for butterflies in early summer. Salmon spawn from November to December. Visitor center. Located on the American River Parkway, a 23 mile bike trail between Folsom Lake and downtown Sacramento. Site Notes: Be sure to visit the special exhibits inside the Nature Center. While there, also visit with rescued reptiles, mammals, and birds that now make their home indoors. On your way out grab a trail map and calender of free weekend events led by staff naturalists. Nearby Viewing Sites: The Effie Yeaw Nature Center is located in Ancil Hoffman Park and is part of the American River Parkway. The American River Parkway starts at Discovery Park at the confluence of the American and Sacramento Rivers and follows the river east from the city of Sacramento to the Nimbus Hatchery near Folsom. The American River Parkway is found on the north and most of the south sides of the river considered the 'jewel' of Sacramento. The parkway stretches 23 miles and offers open space, oak woodlands, rich green riparian flora, paved trails and access to the Beautiful 'Wild and Scenic' American River. Festivals & Events: This is a field trip location for many schools in the region. Creek Week events are held at the site each spring. Parking Notes: Wildlife can be viewed from the roadways and the parking lot that borders the Effie Yeaw Nature Center preserve. How to Get There: From Sacramento, take Highway 80 east (toward Reno) and take Madison Avenue East exit. Stay on Madison for almost 2 miles and turn right on Manzanita. Travel 3.5 miles on Manzanita (name changes to Fair Oaks Boulevard). Turn left on Van Alstine and drive 0.4 mile, follow signs to Effie Yeaw Nature Center (located in Ancil Hoffman County Park).